Cocoa Plum "Romantic Sunsets "
The Cocoa Plum apartment is a ground floor apartment with stunning views of the ocean and offering direct access to the sandy sun deck from the lounge, it also has it's own private patio with BBQ with ocean views. It sits within a group of nine apartments, a manager lives on site. Access to the beach is through a gate on the property. We have manned security between 7.00 pm and 7.00 am and private secured parking should you wish to rent a car. If you're feeling adventurous, experience some amazing snorkeling right in front of the property and remember to be outside in time for those amazing sunset views that we are named after, they are simply breathtaking, we have the perfect location to witness the green flash as the sun sets over the ocean, something considered to be a sign of good luck to witness and believed by some cultures to be a "Glimpse of Paradise" In our garden area we have a swing and playhouse that has recently been remodeled and fitted out with a full kitchen, with parents in mind; we have a comfortable patio set allowing parents to wait in comfort while their food is being prepared and cups of tea are made. Turn your holiday into a nature hunt, we have recently added helpful laminated identification cards showing all the Bahamian sea life you are likely to come across on the beach, in our ocean and in our rock pools, feel free to take them to the beach but please return them to the apartments for other guests to use. Please note that over the festive season I only take bookings for a weeks stay starting 16th Dec - 6th Jan. If you’re here to relax, a long stretch of sandy beach can be accessed through a gate at Sunset Cove stepping right out onto where you can lay in the sand or take a dip in the turquoise blue ocean. Alternatively, chill out in one of our hammocks under a palm tree on our ‘sandy sun deck’ with a cocktail and let the world drift by. We have picnic tables and barbecues available for your use and beach toys available to keep the little ones occupied. Some of our apartments feature direct access to the sun deck from your lounge or bedroom. On the sun deck, steps lead down to the ocean where guests can make use of our 4 kayaks or try our sea hammocks which are very popular. SO AMAZING!! Pictures do not to this place justice. Mary and Peter are awesome. Place and views AMAZING. Will most defiantly stay here again. Paradise in Nassau on the Beach. Far enough away from the crowds of Cable Beach. Close enough to enjoy all that Nassau has to offer. Open up your patio door and have your morning coffee right out back on the beach. This is a very relaxing and basic condo complex. Very much a cottage right on the beach. Grill your own dinner out back your patio door, have a fresh Conch salad right outside your front door. Dramatic Sunsets that will move you every evening. Go snorkeling right out side of the unit , lots of marine life to see and enjoy right there. Peter and Mary are always there to assist in anything you may require. They even arranged for a cab to pick us up at the airport and take us grocery shopping prior to getting to the condominium. A nice complex run by great people. Mark. Mary is one of the most understanding VRBO home owners. She was nice enough to arrange a taxi to pick us up from the airport, she also helped us with early check-in and late checkout! The property is literally on the water and a few minutes away from downtown. I will definitely be staying there next time I’m in Nassau! 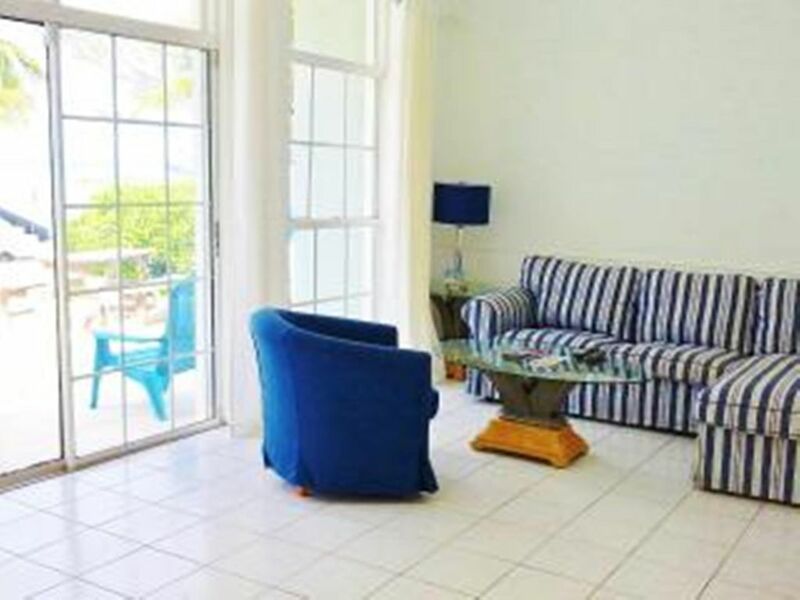 The Coco Plum apartment at Sunset Cove was very clean and well appointed. The owners were easy to deal with and very friendly. We really appreciated the owners' offer to have us met at the airport by a taxi to take us grocery shopping, wait for us before taking us to the property. Another welcome touch was the binder with local information such as recommended restaurants, things to do, bus routes etc. It helped us a lot. There is also a phone available for free local calls. The kitchen is on the small side, but had everything we needed. The bed was comfortable, but the pillows were a little flat. The location of this property is fabulous. The beach is right next door and there is OK, but not great, snorkeling on a small reef in front of the property. The beach had a significant amount of washed up sea grass which was not cleaned regularly. The beach area of the patio was clean, well maintained and a great place to sit and listen to to the waves and watch the sunsets. The only deficiencies that I found were:1. No barbecue - many units at Sunset Cove have barbecues but not Coco Plum. This was not too important to us as we did not do much cooking. However, if this is important to you - you may wish to confirm whether your unit has one before reserving. 2. No screen door leading to the patio - the advantage to living right on the beach is listening to the waves rolling in. However, there are mosquitoes and biting midges (sand flies) in Nassau and we had to close the patio doors in the evening to keep the bugs out. I noticed a few units that did have a screen door but not ours. Still, over all this was a very nice place to stay. Cocoa Plum’s terrace runs the unit’s entire length, facing the water head on. With the curtains pulled back, we could enjoy the spectacular view from indoors; when drawn, at night, the white curtains only enhanced the unit’s spa-like feeling. Furniture is sturdy, clean, and comfortable. TV is big. WiFi is strong. Kitchen is well equipped. The bedroom sports an enormous closet (along with a super-sturdy desk with drawers). After a bit of thinking, we used the large counter in the laundry alcove to unpack our toiletries and had more room than would have been offered with a medicine cabinet behind the mirror. PLENTY of storage space, and this is not always the case with vacation rentals. No doubt there are appealing, comparable places that are in or closer to town—but we preferred this location. You can’t see the big resorts, which is nice. Also, I think that, since a review last season, a broad sidewalk has been installed on the main road, so there’s just a short walk to it and then it feels very safe. We walked back and forth to the grocery store several times. In addition, there is a small convenience store nearby that sells soda, water, sandwiches, etc. The neighborhood is ‘steady.’ Neither posh nor sketchy, but a place where real people live (and I’m told, they tend to know each other). Very short walk to what’s essentially a private beach (we shared it with just 2 other families—and two frisky dogs). Finally, Mary and Peter are gracious, warm, good-natured hosts. This is their home and they know it well. Ocean-front properties are expensive to maintain. They and their staff keep this place in tip-top condition. We have already booked a return visit in 2019. It is a beautiful location. The apartment was clean and well-maintained. It’s not as fancy or luxurious as some of the resorts, but the views are spectacular, right on the ocean, with a sandy beach just a few minutes away. The owners are nice and helpful. Bus stop just a few minutes away, and for $1.25 you can go downtown to take in all the local sights, restaurants, shopping, etc. The front of the property has a nice sitting area for a morning cup of coffee and some quiet time. The back of the property has beautiful ocean views, right on the water.